Don't Eat the Paste: Christmas Crochet- giveaway, review and blog tour! Christmas Crochet- giveaway, review and blog tour! It's the season to start really getting ready for Christmas. 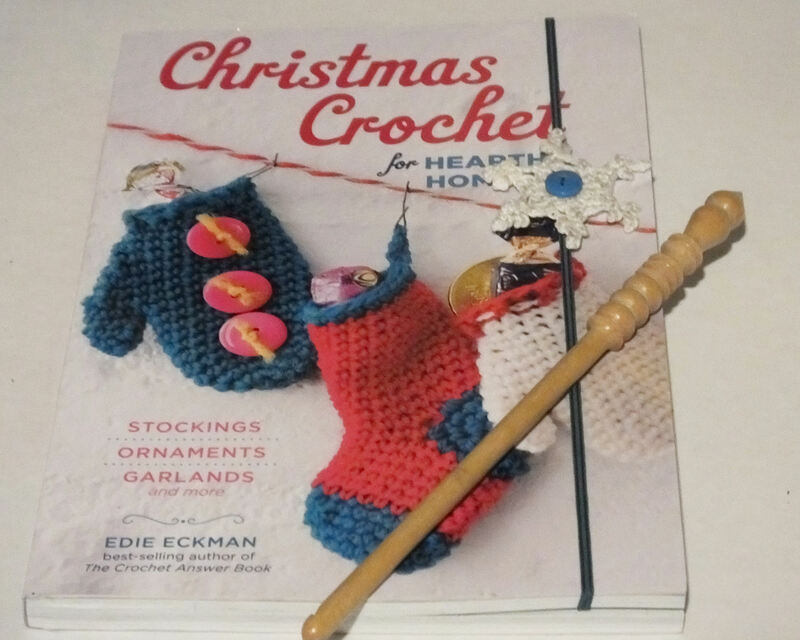 Edie Eckman, the author of some of my favorite crochet books* has written a wonderful collection of patterns to start decorating. 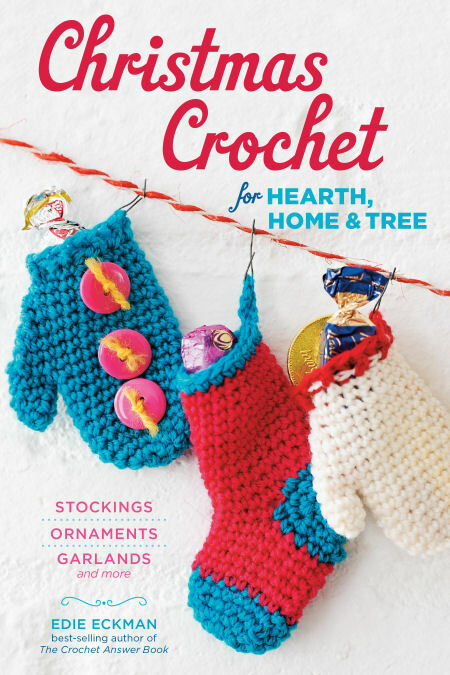 Christmas Crochet for Hearth, Home and Tree is full of easy to accomplish, quick stitched patterns that look good and fit the season perfectly. My favorite kind of crochet books have both written instructions and international crochet diagrams. This one has both. The written instructions are easy to follow, and the diagrams are clear, and easy to read. The patterns are good for all levels. For people who have been crocheting for a long time, things like the snowy looking 3 dimensional tree decorations will work up in an evening, and putting together enough socks and mittens for a sweet, homey advent calender can be done in a week of evenings. For beginners, they can get practice in following diagrams and simple shaping techniques using worsted weight yarns and simple stitches. My son is just learning to crochet using another book from Storey, and he's going to help me make the Advent calender. There are some wonderful Christmas stockings in here as well, and they are also made of worsted weight yarn. You'll find a pattern for everyone in your family so they can all have a different handmade stocking that suits their personality. Bright stripes, polka dots, a complex looking peppermint colored stocking done in seed stitch, some gorgeous single color stockings that use embellishments or texture for interest, and my favorite- the flame stitch stocking which has texture and great color work. The Christmas tree ornaments are great. My favorite are the felted ornaments. They are worked in motifs and make a great take along project and a good project for beginners since felting is so forgiving. The little birds are another favorite, folksy and simply too cute for words. The styles are on trend for a homey, comfortable Christmas. Bright colors and easy to find yarn are a winner. I made one of the snowflake motifs from one of the stockings in thread to decorate a simple headband /bookmark made using 1/8th blue elastic and a button center. I've been so busy working on a big project, doing some of the small and quick projects from this book is very relaxing. Storey Publishing gave me a copy of this book to review, but will also give one of you a copy! USA only. Comment on this blog post with your crochet decorating plans for the season to enter or click the Ravelry link below and comment on this blog post with your favorite project. On Monday, November 17th, I'll put all the names in a stocking and let my daughter draw one winner to receive a copy. Don't forget to include some sort of contact information on the comment. Ravelry name, Facebook name or email address. You can also check out the rest of this blog tour in the next couple of weeks to see projects from the book and get more chances to enter and win a copy! Check out this book on Ravelry! Love the advent garland! Currently working on a hired project of 10 roller derby hats. But that advent garland is beautiful! I have been making hats, scarves, and fingerless gloves, along with toys for my friends. I also have plans to make mini Christmas stockings and hopefully a Christmas inspired afghan. HI, must get started on my Bluework Snowman project! such a neat Advent Garland! Thanks for sharing! Making some start and Christmas stocking ornaments for the tree. I would love to win the book!! looks great. I'm hoping to get crochet ornaments done this year. I think I should have started them in June! I am currently making a crocheted round ripple tree skirt and then I plan to make crocheted christmas curtains for my kitchen. I have been making cowls, also plan on some instant gratification ornaments. Crochet is so much quicker than knitting at Christmas! I love making funny/weird looking santas, snowmen and reindeers. I also plan on making a mouse angel. I am participating in a local craft fair, so I'm making a variety of things. I'd love to make ornaments and stockings! I plan to crochet some birds for the Christmas tree. I would make the stockings and mittens for the fireplace, I think they are the best! I am hoping to make a few ornaments this year for my tree. I'm trying to make it easy for myself this with a low-stress holiday. In other words, I'm not planning on making gifts or decorations. I still have a birthday present and baby shower gift to make in the next 4 weeks. I'm working on a crocheted nativity set for my kids. I am working on santas! i made three for myself and then I got asked for 4 more so I´m all up in red and white yarn here! Crochet ornaments for a family gift exchange! I may end up making tree decorations. If not, I'm making scarves, lots and lots of scarves.